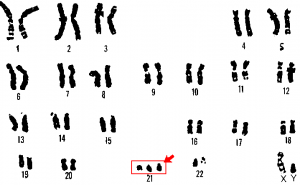 Aneuploidy is an abnormal chromosome number, typically characterized by the presence of an extra copy of a single chromosome or the absence of one copy of a single chromosome. 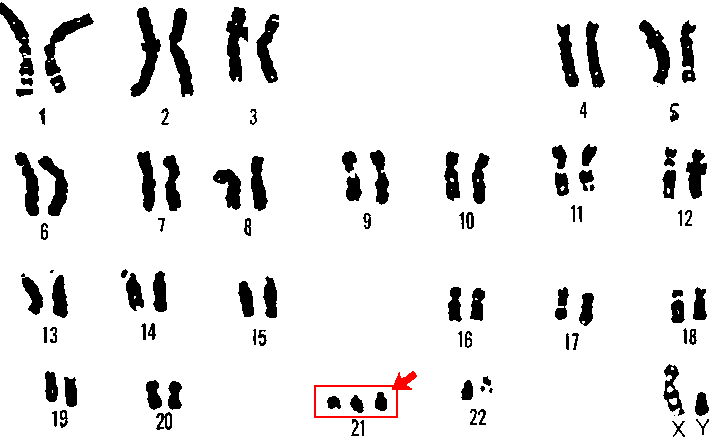 For example, trisomy 21 is the presence of an extra copy of chromosome 21 and causes Down syndrome (see figure). Before cell-free fetal DNA technology, the only way to detect aneuploidies with certainty was through karyotyping following amniocentesis or chorionic villus sampling, which are both invasive procedures with risk to the fetus. During cell-free fetal DNA testing, the fetal DNA fragments circulating in the plasma of the maternal blood supply are isolated and the relative amounts analyzed. The first such test on the market is able to detect an increased amount of chromosomes 13, 18, and 21. The test is called MaterniT21 and is produced by the biotech company Sequenom. Sequenom reports sensitivities greater than 99% for trisomy 21 and 18 and a sensitivity to trisomy 13 greater than 91%. Other companies have similar tests in development or have recently placed them on the market. Traditionally the gender of a baby is determined by ultrasound sometime during the second trimester of pregnancy, if the parents wish to know the gender. Newer tests using cell-free fetal DNA make gender testing through the detection of Y chromosome sequence possible as early as the 9th week of pregnancy. These tests are available direct-to-consumer through the Internet or in some drugstores. The testing kits include a lancet for withdrawing blood and a DNA preservation card for blood collection. The card is mailed back to the company and then analyzed for the presence of Y chromosome sequence, indicating a boy. These types of tests have been clinically proven to be 95% accurate. If a father is affected by a genetic condition, the cell-free fetal DNA can be analyzed for the presence of a specific mutation related to the condition. However, the same disorder cannot be present in the mother because it is impossible to distinguish the maternal DNA fragments from the fetal DNA fragments.